I think Lancaster County does fall like no other place on earth. It wears it so beautifully. Rustling golden cornfields and pumpkin patches dot the rambling, bucolic countryside and are as plentiful as roadside farmstands! Leaves saturated with brilliant color fall quietly on country lanes and covered bridges. And quintessential fall elements like mums, marigolds, hay bales, and big plump pumpkins fill front porches alongside rocking chairs draped with cozy quilts. Lancaster County is spectacular in the fall! A real throwback of bygone days and nature’s bounty! Not to be outdone by all the beauty outside, I’m celebrating fall inside too! Our current episode #96 is all about HIS/HER DECORATING. We are sharing lots of ideas for decorating so the guy in your life won’t feel so overcome by a feminine touch. 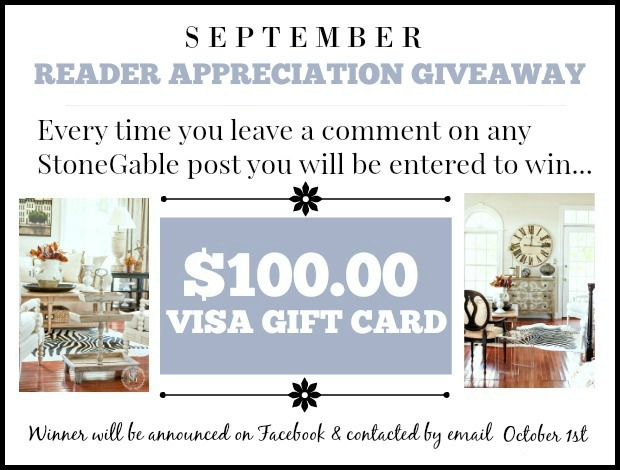 It’s a win/win decorating episode for both of you! 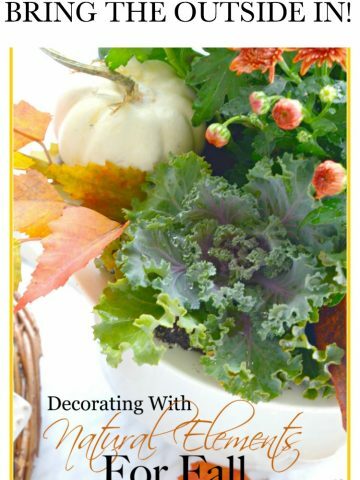 And because today’s post is about fall decorating you should listen to episode #93 FALL DECORATING. 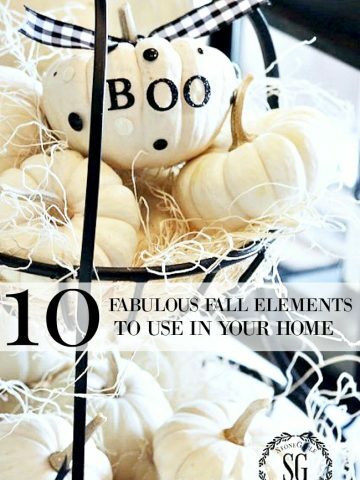 Tons and tons of fall tips to make the inside of your home beautifully autumnal! Today is HOME STYLE SATURDAY. 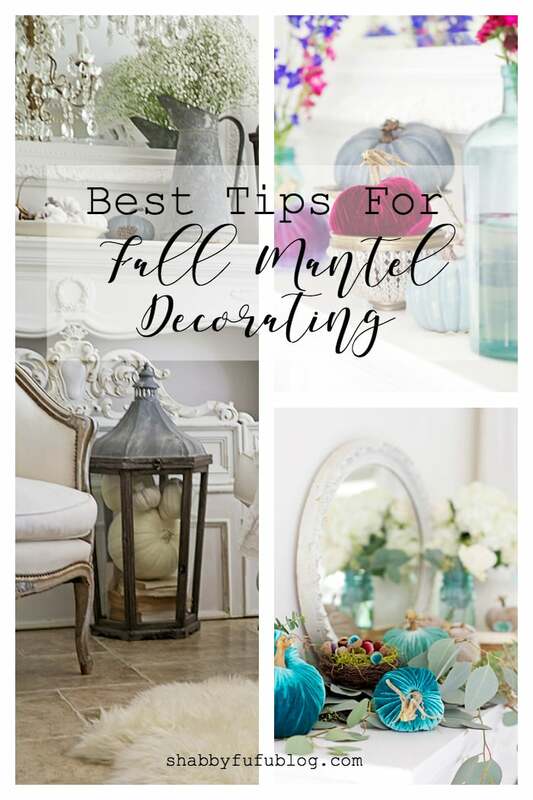 Make sure to stop by the gorgeous blogs at the end of this post! This year I am easing into fall decor! I’m starting with very soft colors and simple designs and as we delve deeper into the fall season my color palette will take on more saturated tones! Fall is more than orange pumpkins and corn stalks. Our area really could be called “pumpkinland”. You can find every shape and size and kind of pumpkin your sweet heart desires! But it is still just a couple weeks or so early to bring home our natural bounty in bulk! I was lucky enough to find a few pumpkins at the Amish stand down the road and I bought every one! And what I could not find at the Amish stand I made myself. I have been up to my eyeballs in faux (sounds better than fake) orange pumpkins. I’ve been transforming them into blue and green and white pumpkins for days! It’s nice to have the real thing, but now I have a stash of faux pumpkins in colors I love. You can find a tutorial for transforming orange pumpkin white HERE. Today I’m sharing the front part of my home. It’s a little more formal… arched windows, wainscoting, high ceilings, interesting millwork, french doors… you get the idea. This year I’m keeping the fall decorations a tad more formal and quite simple. A nod to the architecture of our home! One, big, over-the-top fall display sprawls across my dining room table. I think it calls enough attention to itself so the rest of the fall decor in the front of the house is much more subtle! The inspiration for this year’s decor are two pumpkin pillows that grace the head chairs in the dining room. The buffet is simply decorated with a wooden tiered stand filled with lots of white decor! My garden is filled with huge busy amaranth plants. Small round globes in white and purple and lavender. Using what I have in the garden I picked a basket full of white amaranth to add to StoneGable this fall! You can see the white stand decorated a little differently for fall HERE. I think of the front of my home is sorta like a bowling alley. It’s long and the foyer connects the living room and dining room! Very open! Candles in the white pottery crocks are lit in the evening and give off the prettiest glow! Now let’s head to the living room. Bittersweet is one of my favorite fall elements to decorate with in the fall. And Lancaster County is full of this invasive plant! Hedgerows and fallow fields often are filled with it. Again, it’s just a tad early for it to be harvested. When I can get my hands on this pretty, nuisance plant I’ll add it to the decor in my living room. This sweet pumpkin is called “porcelain doll”. So interesting! I put it on a wire pedestal cake rack! The large gray urn is waiting for bittersweet! 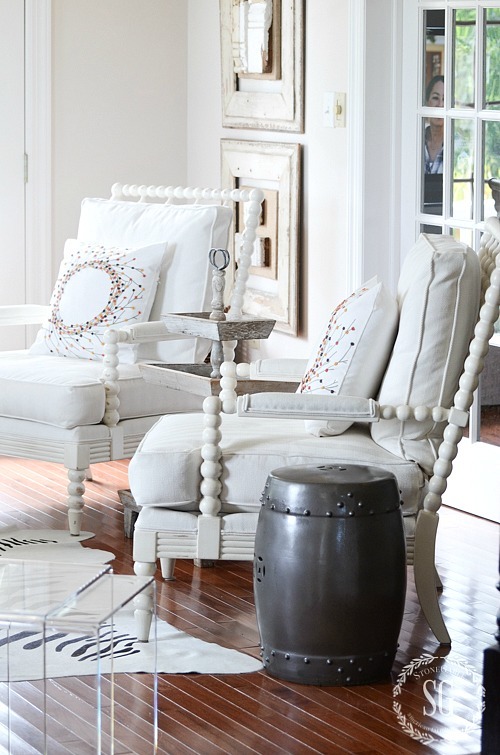 The bubble chairs have beaded wreath pillows. These pillows will work all the way to Thanksgiving! Simple can be just perfect! I hope you have enjoyed Part 1 of THE SOFTER SIDE OF FALL TOUR. Next Home Style Saturday I’ll be sharing the rest of StoneGable in THE SOFTER SIDE OF FALL TOUR part 2! Remeber to follow me on Pinterest too. 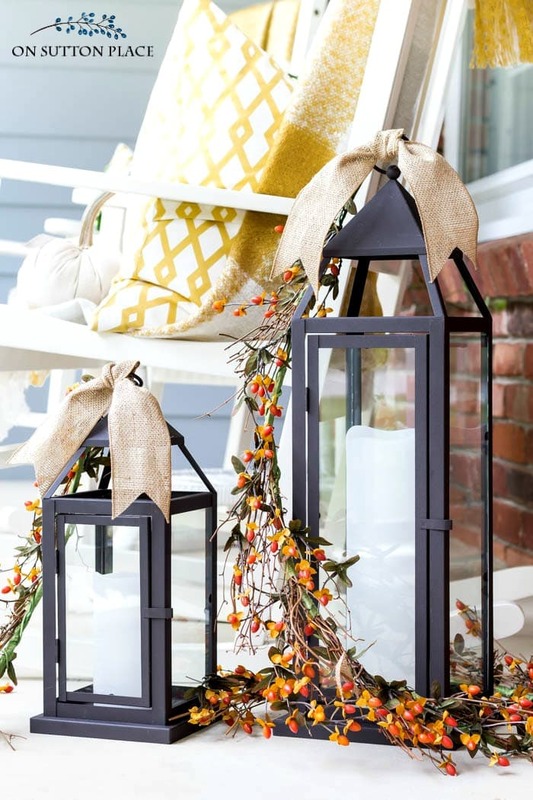 I have over 2,000 fall ideas waiting for you HERE. Thank you for sharing your beautiful home. I love, love, love the piles of pale and neutral pumpkins on the dining room table – so gorgeous, so sumptuous! I feel silly for asking, but how do you eat at this table? I’m not trying to be mean or snarky. I would really like to know because I never quite know what to do with a centerpiece during mealtime – it always seems to get in the way. Thank you again for the inspiration! Great question, Ann! We mostly eat at our kitchen table. When we want to eat in the dining room we take off the decor and I set a table. It not as hard as you think to deconstruct a table. I put everything in a laundry basket and return it all to the table after we eat. Hey, Yvonne! 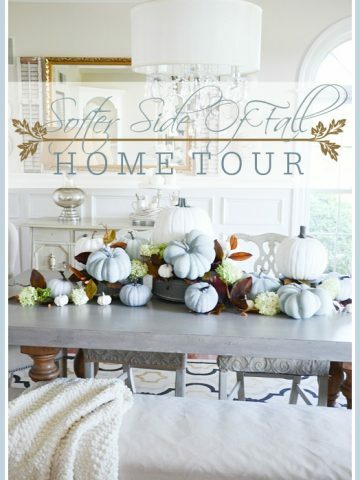 Just wanted to let you know that we loved your Softer Side of Fall Tour so much when you shared it at the #HomeMattersParty last week, we’ve FEATURED it THIS WEEK! Hope you can check it out when you get a sec. Happy Friday!!! I am in love with the rug under your dining room table. I first saw it in the cottage journal and now on your blog. Where did you find it? 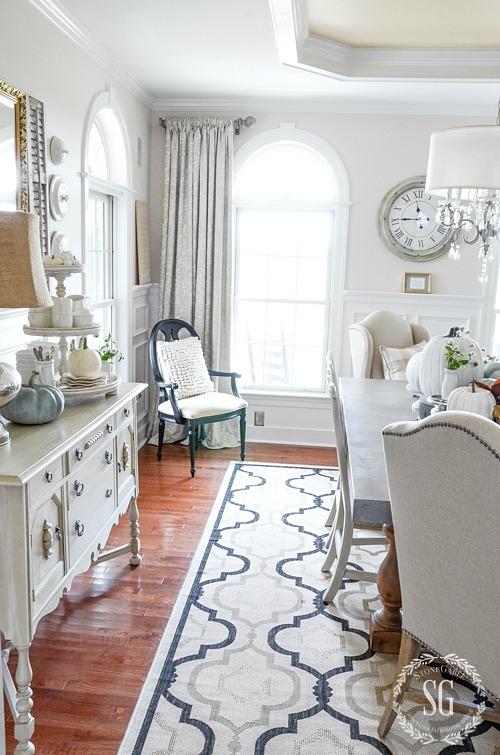 Hi DeAndra, you can find my dining room rug here: http://fave.co/2xAEJGv It’s an indoor/outdoor rug!!! 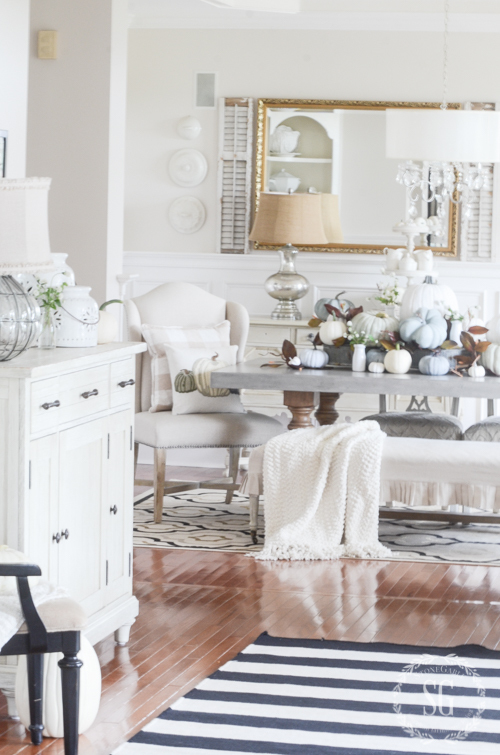 Your home always looks so inviting! I’ve been going more neutral in my fall décor as well. Love your house always! 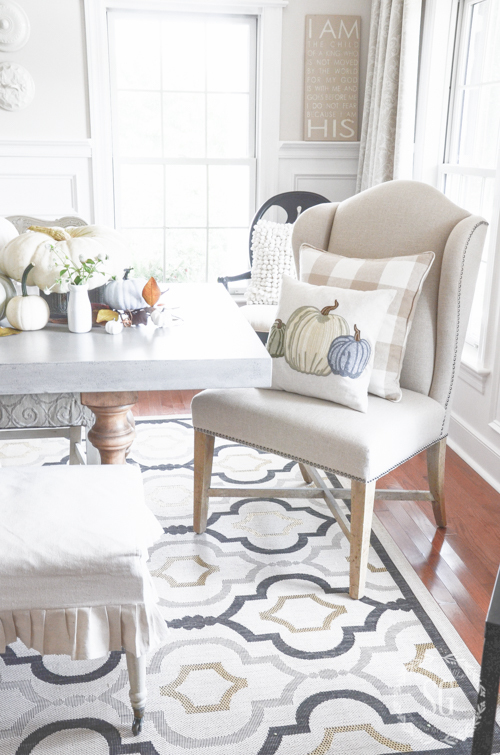 Your pumpkin table looks great and the soft colors are lovely. This is fall decorating done right. Orange can be tiresome. Just beautiful! Thank you for sharing your beautiful home with us. I love the blue pumpkins. Would you mind telling me where you found the beaded pillows? 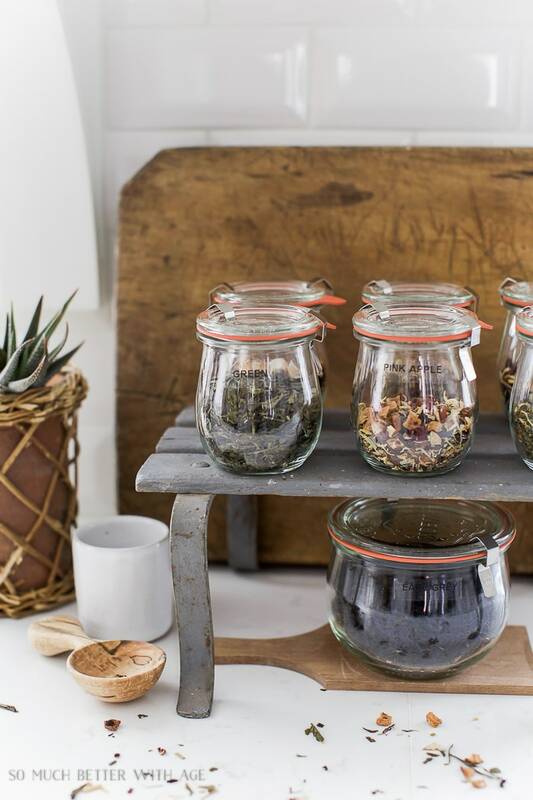 Love those porcelain jar candler holders. I can just imagine the candlelight shining through the cutouts. 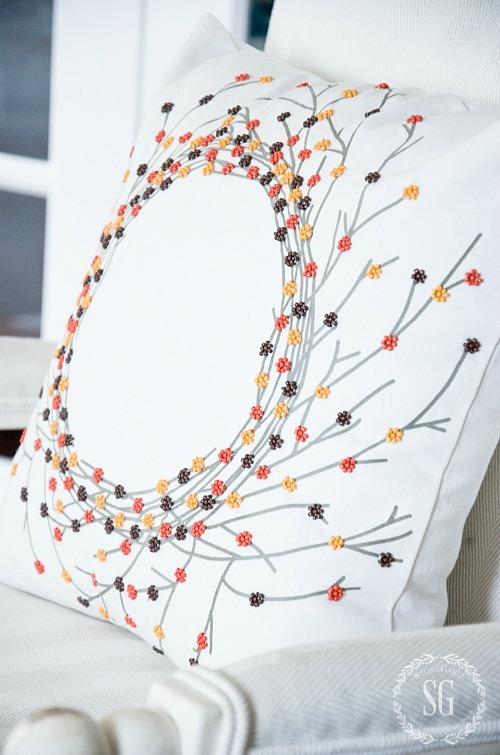 Those wreath pillows! Absolutely love them! Your home is so inviting. Thank you for sharing it. 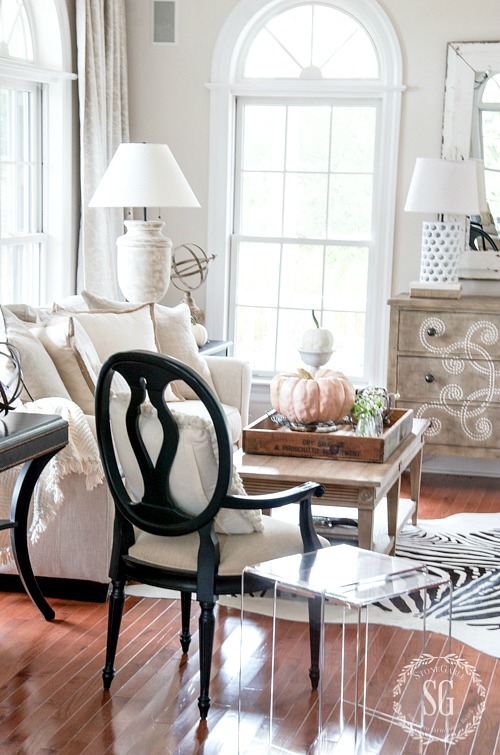 I am now officially inspired to decorate for Fall…your home is stunning! LOVE, Love all the white. Even for fall..Hope you are doing well. I am absolutely in love with your house!!!! So beautiful and full of fall decor. It’s so hard getting into the spirit of fall this soon down south. But you have inspired me again Yvonne. ? 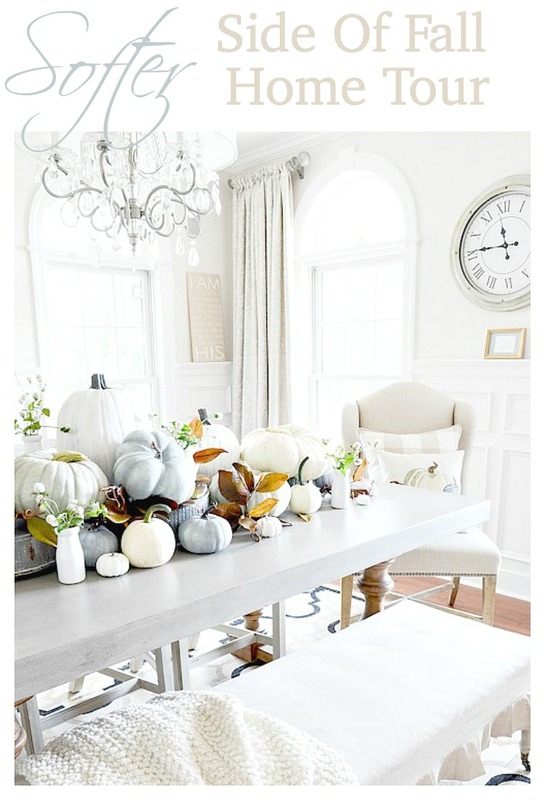 I love, love, love your dining room table ” pumpkin scape”. I have a white kitchen/dining table and can’t wait to try this!!! I also can’t wait to try your meatball recipe. Thank you for sharing!!! 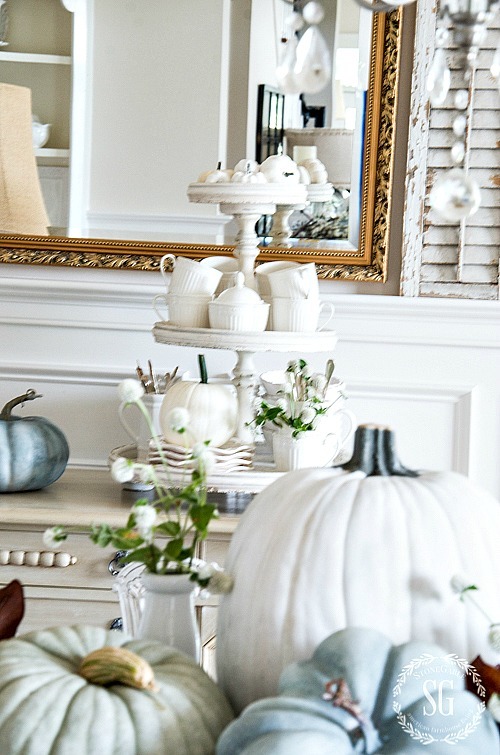 Just Beautiful Yvonne…..so much Fall inspiration! 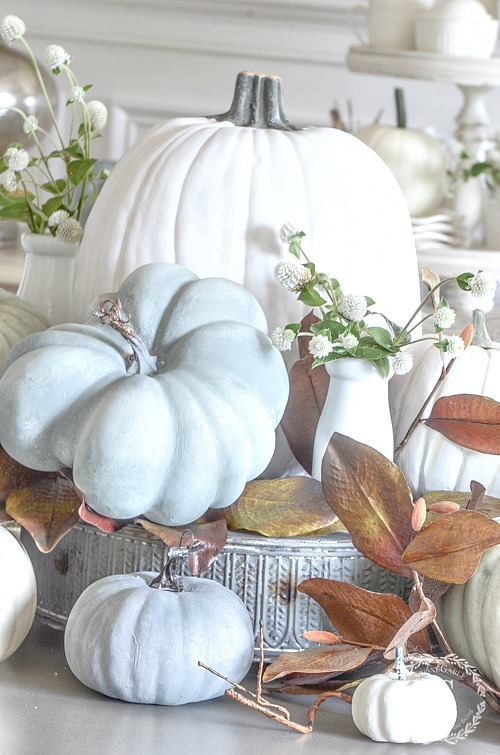 I love the softer color pumpkin colors especially the blue/gray Cinderella and pinkish blush color pumpkins. I agree there is no more beautiful place on earth than Lancaster county in the fall. We have been to Lancaster many times and during all seasons but fall is especially beautiful. I love just riding the back roads during the leaf season taking in all the beauty the area has to offer. We always stop by Diener’s restaurant on our trip for a good Penna/Dutch meal. The locals including many Amish and Mennonite eat here so you know its good cooking! I would also recommend a trip over to Longwood Gardens during the Fall or Christmas season. It incredibility beautiful and have world renowned gardens. I love your change from the oranges! I am keeping a neutral mantle with just one orange braided pumpkin. I have to say I really like that look too! Please keep the great ideas coming!! Absolutely beautiful! I tend to agree Lancaster County is gorgeous in the fall. Thank you for sharing your home with us! Love all the white. Beautiful. Love the color and texture contrast of the velvet pumpkins. Gives me some great ideas. Plan to make something similar. Thanks! This has been such fun and inspiring! A little here and there that we each bring to our homes inspired by an idea from your post. I remember when Blue Cinderella pumpkins first came out I boldly chose one from the farm our class went to on our field trip. We passed cotton fields, dairies, oil pumping units and once there got to hear and see how pumpkins grew. As such a Super Teacher wink ? we did all these math lessons about our class pumpkin because they took their pumpkin home. The class had chosen the face. We were to all be watching. Exciting!!! But oh no!!!! I could not even begin to pierce this pumpkin? It was so hard that I could not make a dent in its side!!!! I had a room Mom that I gave it to and told the class well that did not work out. And there my memory ends. It was right at Halloween so I don’t think we ever did carve a pumpkin!!! Did I draw the face upon that gorgeous light blue gray large “squash “???? What did children tell their parents??? I never heard a word from anyone so I’ll never know!!!! ??? so when I choose a blue pumpkin I always smile to myself and remember the pumpkin that refused to be carved!!! Love all your pretty decor!!! I love your blog today, so lovely. We have visited Lancaster County a few years ago and fell in love with the beauty and tranquility. The colors of the farmland, flowers, sweeping landscapes, I could go on and on and not to mention the Amish shops especially the quilts, so beautiful. I missed where you got the beaded wreath pillow. Do tell! Lovely. I’m still holding onto summer until the last minute. Plain & Simple ~ I ❤️ ALL YOUR DECORATING TIPS! 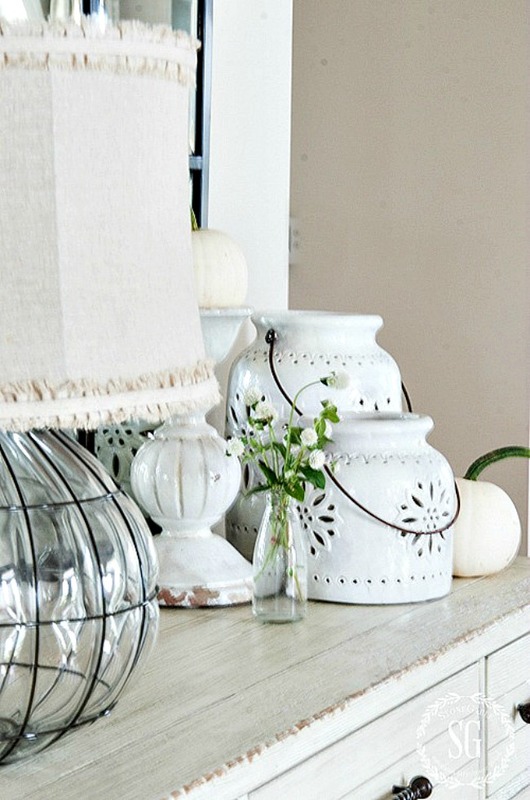 Loving those white pumpkins…they are gorgeous!!! Such a sweet, calm look for Fall. 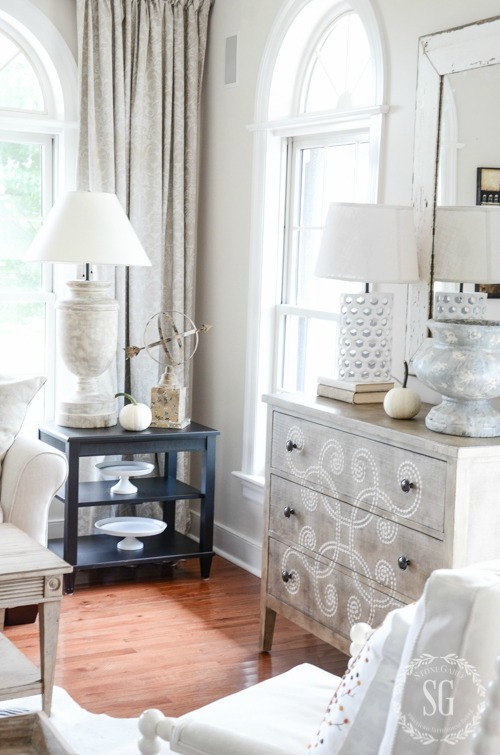 I LOVE, LOVE, LOVE the lampshade in the foyer. BTW, what happened to the sisal rugs in the foyer and LR? I’ve never been a fan of sisals (I’m an Oriental gal myself) but you made me a believer when you put those down. Just wondering. 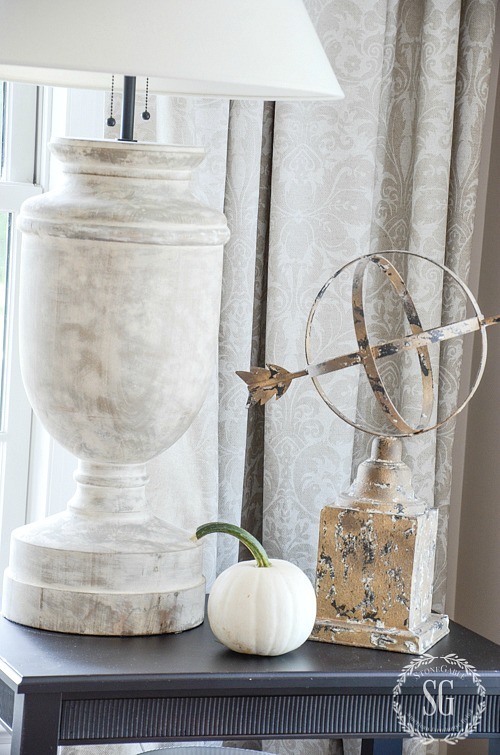 Love the softer side of fall in your decor! It fits perfectly! I just came from a friends fall gathering at the 1824 Walker Farmhouse and snatched up two bunches if bittersweet! Can’t wait to give those bunches a home! I am a neutral girl,I do love the porcelain doll pumpkin. 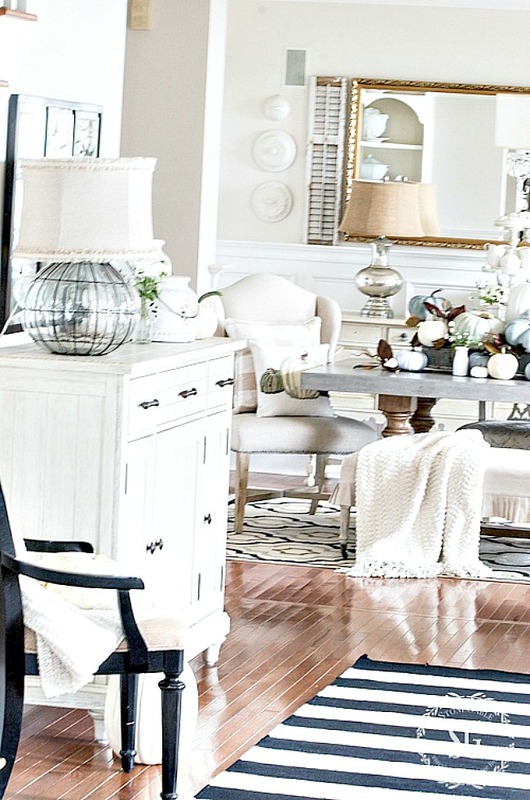 I truly love your home but if you’ll accept a little constructive criticism on this post……. 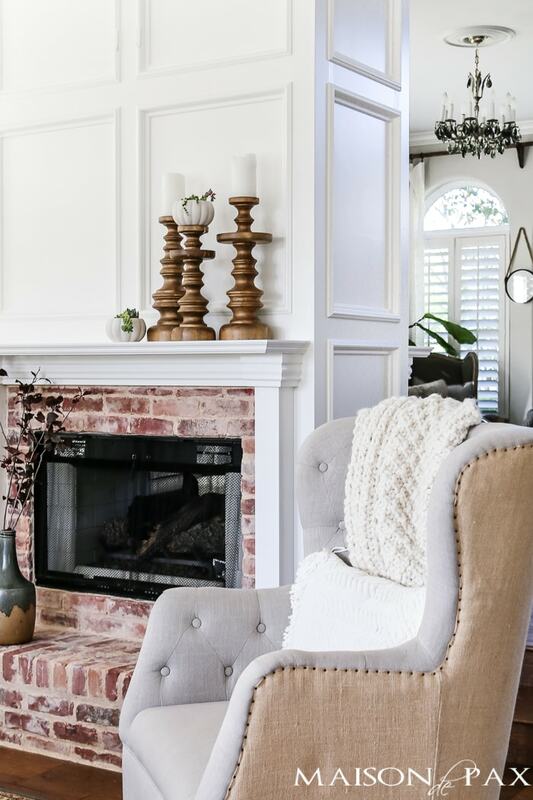 Because there is so much white in your home, it’s hard to see certain things in pictures (I’m only talking about pictures people) A lot blends together and you lose sight of what your trying to show, the wow factor that i’m positive people see when walking into your home. Please don’t hate me, I really love everything you’ve done in your home. I am so envious of your bittersweet! As far as I know, it does not grow here in the foothills of the Rockies and although it was plentiful in rural northwest Missouri when I was a child, it became less and less common as the years went by for some reason. I will look forward to seeing it in your decor! Love the blue pumpkins!! Your fall decorations are beautiful!! I love, love, love the colors you are using for fall! It is so refreshing and looks wonderful! 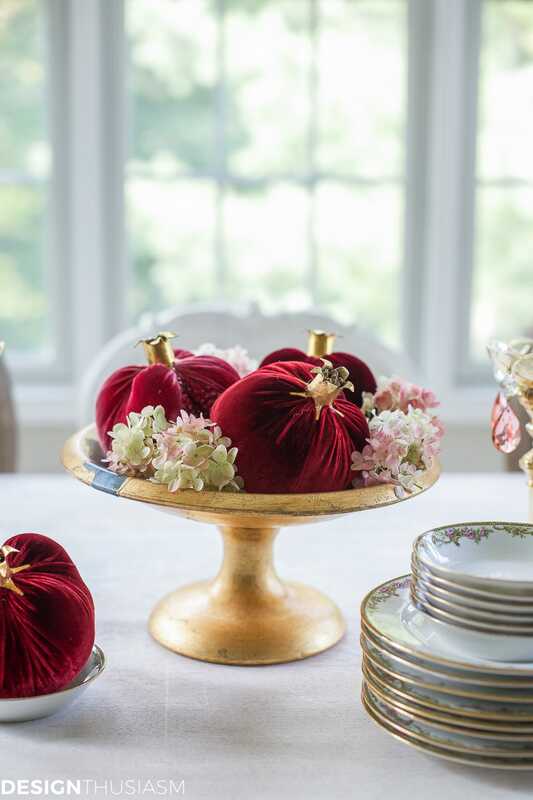 Your dining table centerpiece is exquisite! Good morning Yvonne your fall decorations are simple and yet so elegant. I love your style of decirating and you always are so inspiring to those of us that follow your informative blog. Thanks and have a great weekend????? 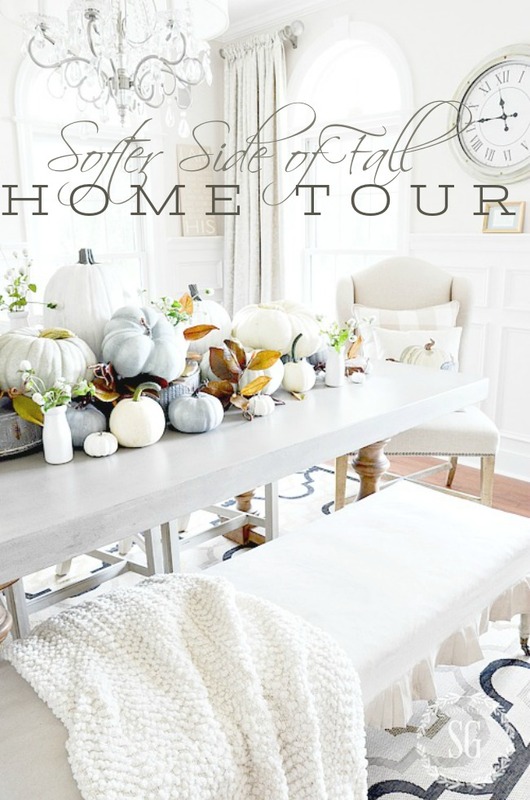 love the dining table piled high with pumpkins! Your pallet of white with blue is so imspiritinal, that it has caused me to rethink fall. I have never been fond of orange, so use it only for Halloween. Now, I am collecting my clear cakestands, trays, and everything neutral that I have together to use for neutral pumpkins that I will paint. 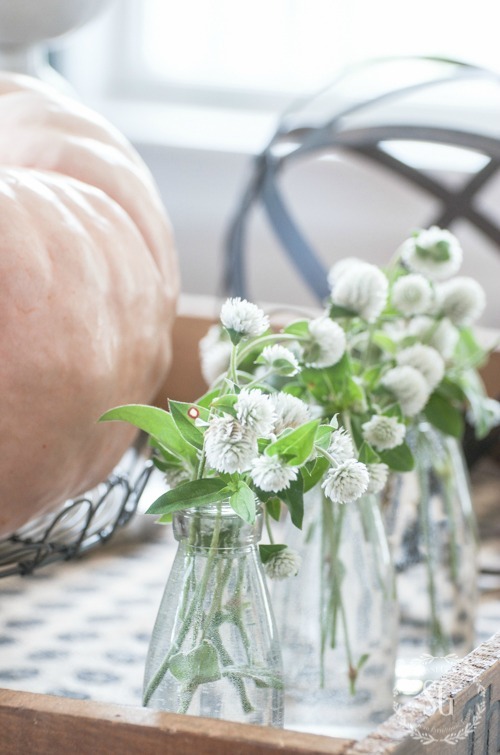 Also, I have a few milk bottles that I can use for “weeds” that look good. Thank you for your blog that is so informative and thoughtful provoking. Your home is so beautiful!! Could you tell me where you found the black wooden chair with the padded seat? 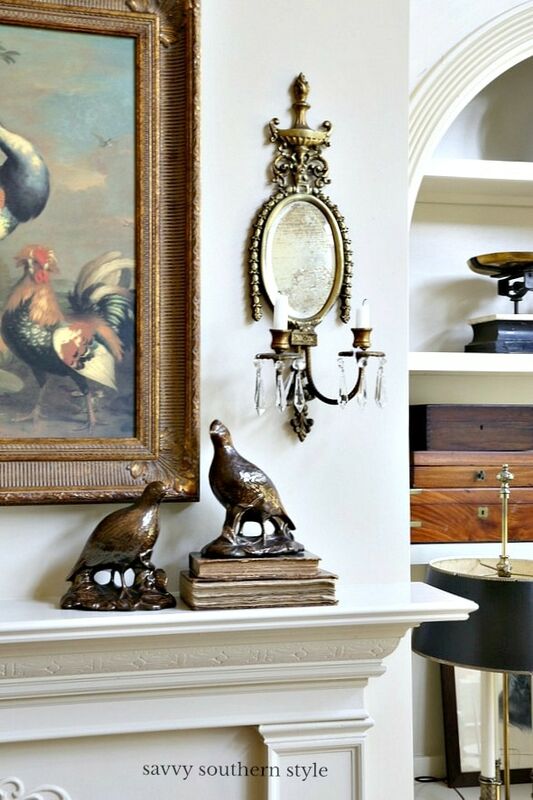 I’m looking for something similar for my entryway. Thanks so much! Hi Christy, It came from Ethan Allen several years ago. So pretty. I found blue pumpkin pillows for 1/3 of the PB ones and LOVE them! Bargain!!!! Happy Saturday Yvonne. Everything is gorgeous, love your style. Thanks for sharing and inspiring. You are the best!! Beautiful, and this year I’m finally loving the blush pumpkin. I found the braided pumpkins that you have on your mantel at Hobby Lobby. Your softer side of fall is just beautiful. Everything looks great and inviting. Beautiful. I miss my visits to Pennsylvania. I think it’s truly the most gorgeous state I have ever seen.